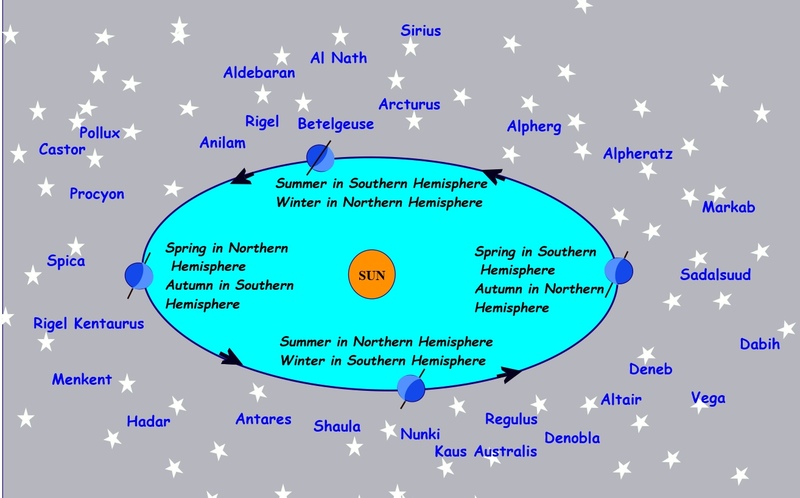 During the early autumn, as the Earth continues to orbit the Sun, the last of the summer stars such as Altair, Vego, Deneb, Nunki and Kaus Australis move away to the west. 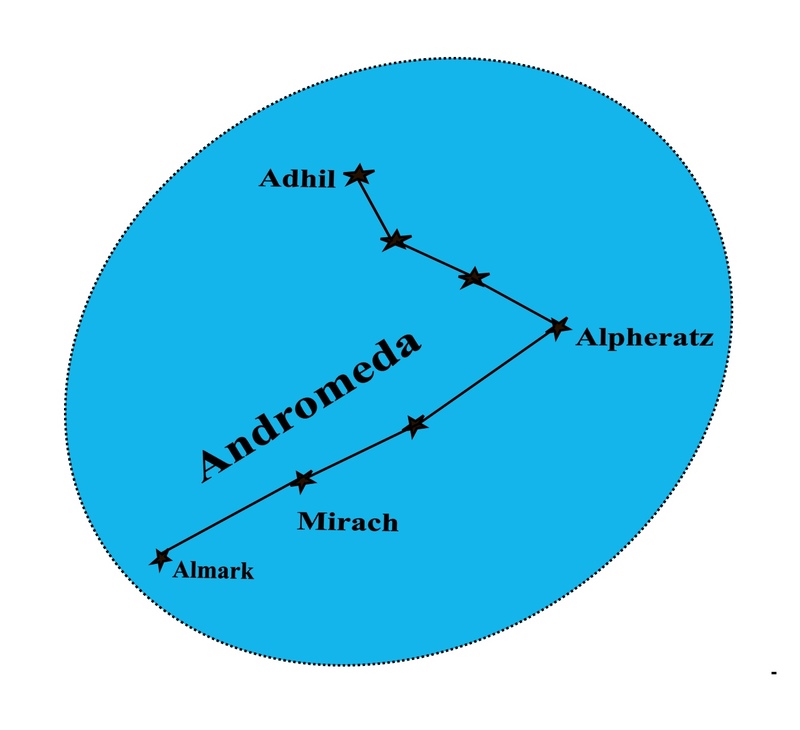 Other stars have taken their place in the northern night sky including Alpheratz of the constellation Andromeda, Sadalsuud of Aquaries and Markab of Pegasus. How to find Andromeda. 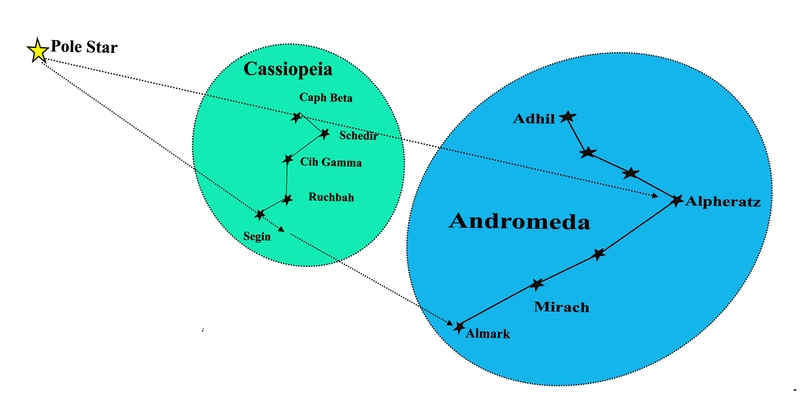 The next diagram shows that, if a line from the Pole Star to Segin in Cassiopeia is extended by about one hand-span, it will point to the star Almark of Andromeda; alternatively, a line from the Pole Star through the star Caph Beta of Cassiopeia will point to Alpharatz in Andromeda. (Note. 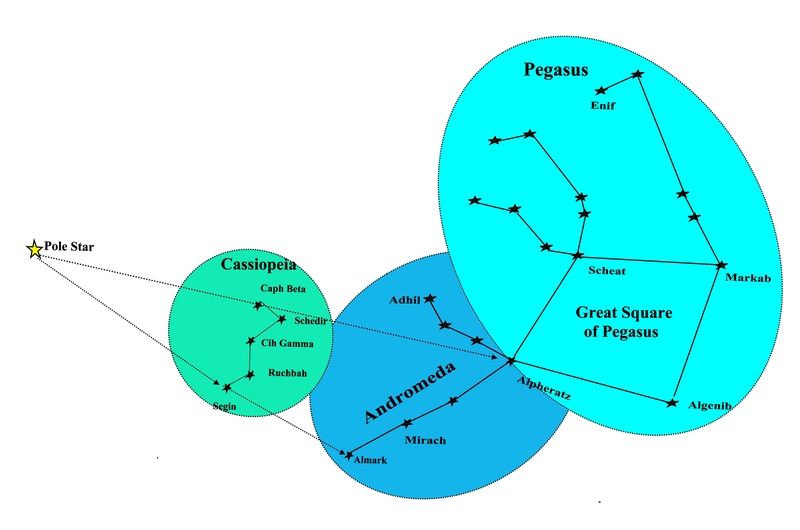 Cassiopeia is one of the northern hemisphere’s circumpolar constellations which we discussed in part 3 of this series). 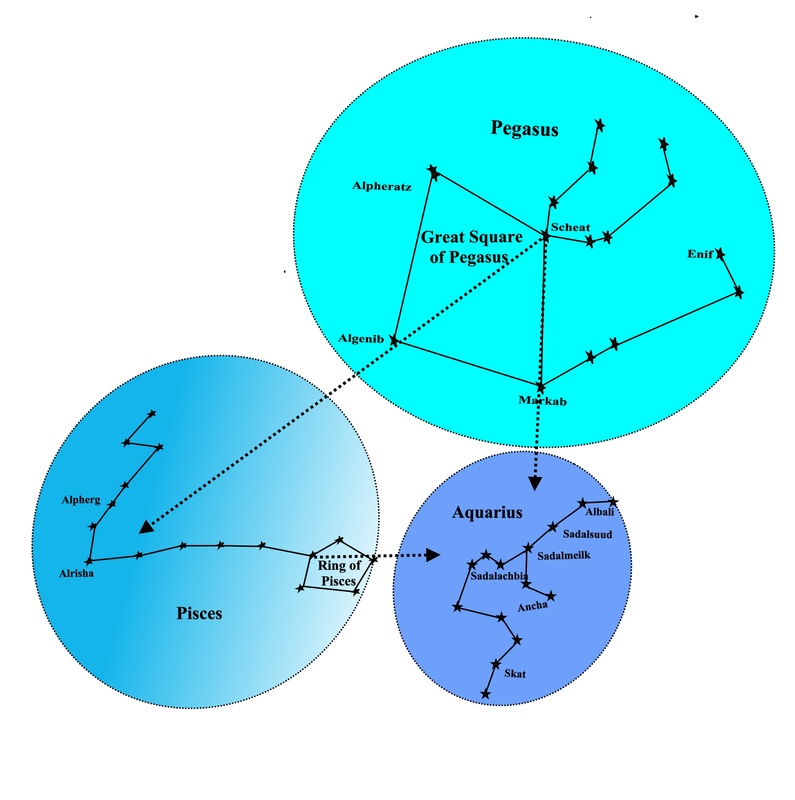 The reason that we have included Pisces in this ‘route map’ is because of its association with the ‘First Point of Aries’ which is the point at which the Sun crosses the celestial equator when it is moving from south to north along the ecliptic. This event occurs on 21/22 March and is known as the vernal Equinox. 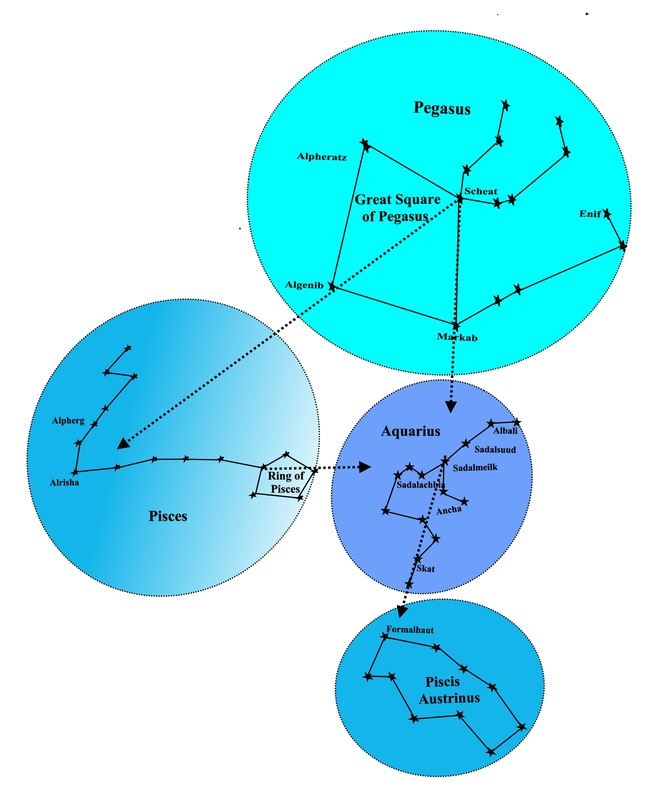 The confusing thing is that, although the ‘First Point of Aries’ lay in the constellation of Aries when it was chosen by the ancient astronomers, due to precession, it now lies in Pisces. Aquarius is a constellation in the southern hemisphere and is visible at latitudes between 65oN and 90oS; it is best seen during the month of October. The brightest star in Aquarius is Sadalsuud an Arabic phrase meaning “luck of lucks”. 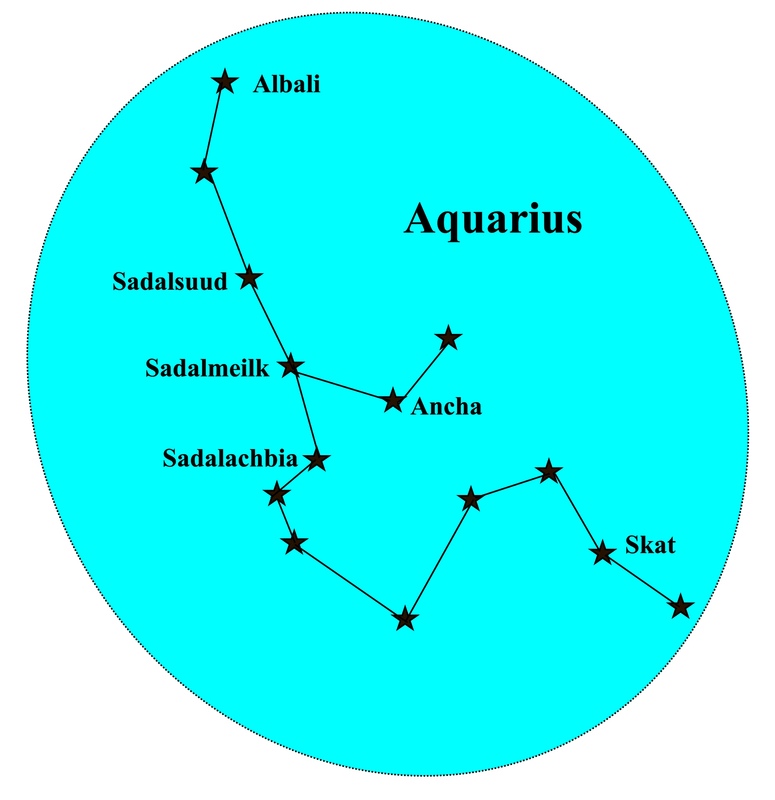 Sadalsuud is not a navigational star and in fact, there are no navigational stars in the constellation Aquarius which, like Pisces, is very faint and difficult to see with the naked eye. Finding Aquarius. Aquarius is a very faint constellation and is difficult to locate. However, this diagram shows that if we line up the two stars that form the base of the triangle at the top of the ‘Ring of Pisces’ and extend that line it will point to the star Sadalmeilk in the constellation Aquarius which is to the south of Pegasus. If we also run a line from Scheat to Markab in Pegasus and extend that line by a palm-width, that too will point to Aquarius. 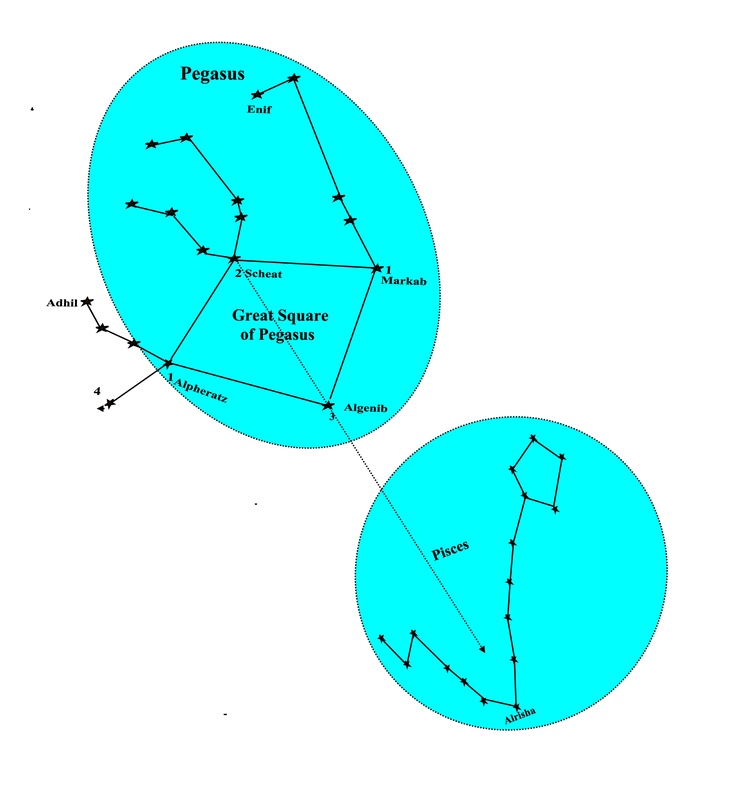 The Autumn constellations, Pegasus, Andromeda, Pisces, Aquarius and Piscis Austrinus sink into the west after December and waiting in the wings to the east are the winter constellations of Orion, Taurus, Auriga, Perseus, Gemini, Canis Major and Canis Minor; these will be the subject of the next article in this series.